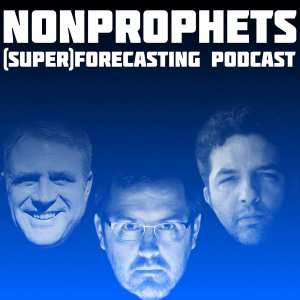 Episode 26 of the NonProphets podcast, in which Atief, Robert, and Scott continue their discussion with German Superforecaster and economist Roman Hagelstein. Their discussion covers Syria (00:12) as well as Germany and Syrian refugees (9:22), the general opinions that Germans have with respect to Angela Merkel (12:06), the Superforecaster investment group (19:28), and a digression into sports betting and the NBA MVP race (31:28). We close with Scott opting to bum everyone out by bringing up North Korea and existential threats (40:22). As always, you may reach us at nonprophetspod.wordpress.com, or nonprophetspod@gmail.com.